Would anybody know of a way to get a hold of the 1/48 scale decal sheet from an out of production Hasegawa A-4M Skyhawk. 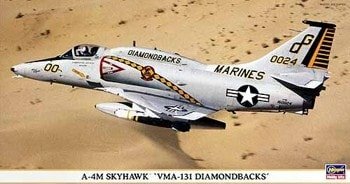 VMA-131 Diamondbacks. What are they worth to you ? I've got brand new Cutting Edge decals, CED48193, for that jet still in their original packaging. This should probably have been entered into the Spares Box thread.